$50.00 that is a real bargain. What colors are they and do you know how old they are? I would like to come across something like that. I hope you can post their pictures. I find its easier to copy and paste the image code than try to up-load. The hen is down behind the male. He is just finished his first adult molt and she is not quite finished with her molt. Now I have to find 2 more hens for my 2 males in the flight cage. Pictures didn't come through sorry. I will try again. This is a photo of the male the hen has a lavender breast. Very Pretty, are you going to breed them? The colors really are brite. I have two red heads and the male has the same colors as yours does. My RH pair have the 6 fledglings I posted about on here. I also have two BH's they only had one out of three chicks survive. I don't remember if you ever said, but what color are your other two gouldians? I like the white breast, my BH females has been going thru her molt since June so I know she is stuck but I am hoping she will finish soon. Now that you have a pair you will be having babies. Since I just went through it, I can help if you have any questions. I am knew to Gouldians but I can share my experience with you. How are your other new additions doing? All of the other finches and canaries are doing great. My owls second clutch turned out to be duds.... but they will try again I'm sure. about your owl's clutch. They did so good the first time. Maybe he didn't breed with her but she went ahead and laid eggs. My societies will lay eggs if they have a nest and egg food even if there is no male. My pair have been sitting seems like forever. Just last weekend I heard very light chirping They have been taking turns sitting never both out of the nest together. Today I heard what sounds like maybe 3 chicks. 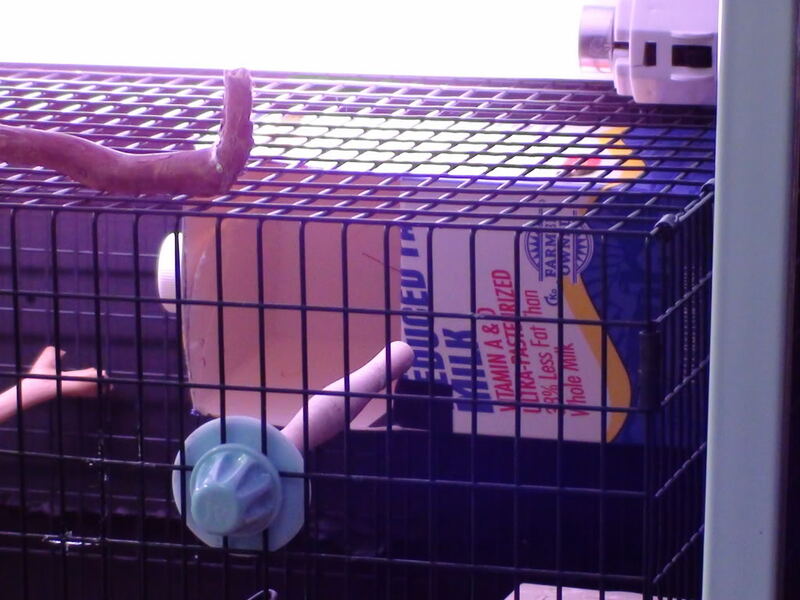 The nest I made out of a milk carton was just to see what they would do.... they made a nest and I have no idea when she layed the eggs or when they hatched. The curiosity is killing me cause I can't see inside the nest. Hi ranchnanny, that is good news about the hatchlings. I didn't know when mine hatched either or how many there were until they were a little older and I saw one of the BH's had tossed one. Its hard when you can't peek but in a way it's good, it keeps us from disturbing them. The babies will get louder when the parents go in to feed them. I had to remove my RH male as the hen would chase him away and she raised six by herself. I have seen the milk carton idea but I did not know if the Gouldians would use it, good to know that they do. I have trouble finding big wicker nests so I am always looking for ways to make my own, I have used kleenex boxes for the societies and wicker baskets for the gouldians with the tops covered with artificial plants. It will be a nice surprise for you when they fledge, any idea when? My first one fledged at 23 days and the last two at 27 days. I think its going to be a couple of weeks yet but I may be wrong. 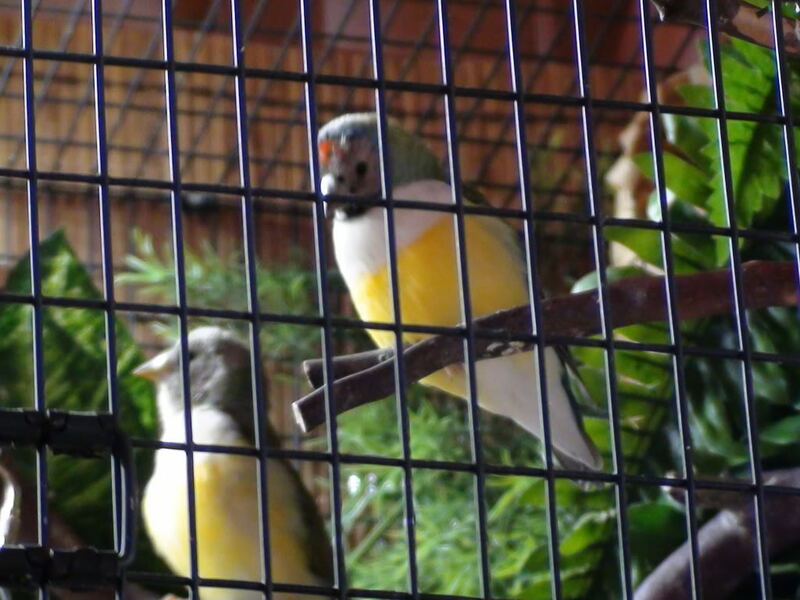 I never dreamed I would be lucky enough to have Gouldian chicks. The gal I bought them from said they had already had a clutch of 5. I am over the moon about these chicks. Oh BTW your new color format is so much easier to read and I love the trees on the sides.....Looks so much better. ranchnanny wrote: Oh BTW your new color format is so much easier to read and I love the trees on the sides.....Looks so much better. I really like to hear feed back, does the banner with all the finches show up ok, I wonder because of different computers. I have to enlarge the print on this forum for me, "old eyes". The yellow banner is a bit hard to read for me I think its the font style. Can you see the picture on top of the forum with the pictures of all the finches? Yes I can see the picture with all the Finches it looks great and the yellow banner looks much better on my imac with the bigger screen. I was looking at it before on my laptop with the smaller screen. The whole website looks beautiful love the new colors much better its much easier to read. Thank you for the compliments. I am glad it's easier to read and I will keep this one. Its hard to find a template that I liked and one that would be good for a Finch site. I was worried about how it looked from your computer, my laptop is the wide screen and I know a lot of people don't have one like that. 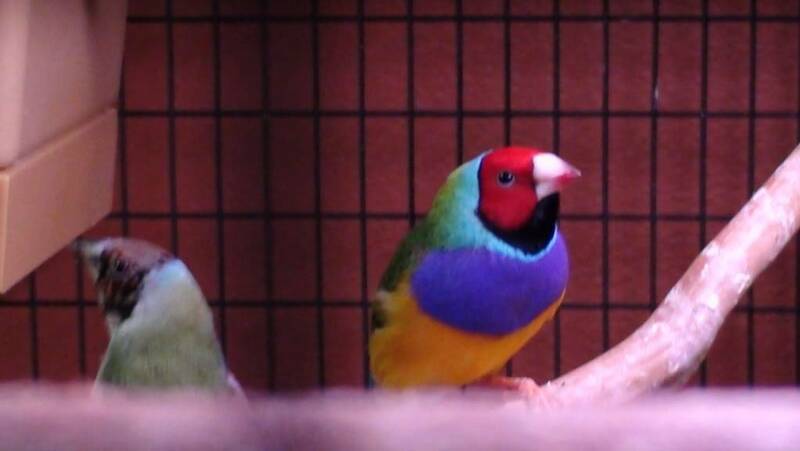 Well yesterday afternoon turned into a nightmare as I saw a Gouldian chick on the cage floor. Did it fall or was it tossed....? Gently I placed it back in the nest I came back a bit later only to find it on the cage floor again. CRAP!!!! What is going on again I put it back in the nest. It wasn't long before it was on the floor again that's 3 times. This time I put it in a box with a heat lamp to keep it warm and I noticed that the crop was not full so off to Wal-mart to pick up a baby wipe heater and a syringe. I can't remember the last time I move that fast I was in and out of wally world in nothing flat and I was so lucky cause I picked up the last baby wipe heater. Got home and set it up with a dish towel and sheets of paper towels a shot glass full of water. Got out the Lafebers baby bird formula and got to work. The chick didn't want to eat but I got some formula into it. Once the brooder was warm enough I moved the chick. I slept in my chair all night after watching tv in the dark. Got up a few times to check on the chick but it was sleeping didn't want to eat. Checked it this morning and it was hungry so new formula and it ate very well. I am excited that the chick made it thru the night with a novice taking care of it. So here I am another night and waiting to feed it again before I go to bed. This chick is about 10 days old + it has pin feathers on its wings and tiny feathers on its tail and the eyes are open but very tiny.